Tom Bacon was the star man against Ipswich. Team manager Carl Johnson has hailed rising reserve star Tom Bacon following a career-best Panthers performance. Bacon piled up a brilliant 14-point haul to help the city club to a crucial SGB Championship victory at East Anglian rivals Ipswich last Thursday. The 49-41 triumph earned four league points to all but clinch a play-off place for Panthers, but it wouldn’t have happened without Bacon’s stellar showing which included four race wins. “Tom has made incredible progress during his time as a Panthers rider,” said Johnson. “We saw enough from him last season to believe that he could really kick on in 2018 and he has certainly done that. “He has produced some excellent performances at home and away, and what he did at Ipswich was definitely the best yet. “It’s a very tight and technical track there, but Tom really likes it and mastered it with some great rides. “Tom hasn’t always had it easy during his time with us. He has often be put into harder races or been taken out of races altogether. Bacon no longer boasts the lowest average of the Panthers team following the release of new September figures. His mark has risen to 4.52 – a vast improvement on the 2.00 entry mark he had when joining the club ahead of the 2017 season – with out-of-sorts skipper Simon Lambert dropping to the foot of the in-house standings on 4.43. That means Lambert, who failed to score in his last two meetings, returns to reserve with Emil Grondal going back up into the main body of the season. The Danish rider enjoyed success in the number two role earlier in the season. Johnson added: “We all know that Simon’s style of riding doesn’t suit tracks like Newcastle and Ipswich. They’re certainly not two of his favourites. That doesn’t mean he is not disappointed to have failed to score, though. No rider enjoys being stuck at the back and he is well aware that we can’t carry riders at this stage of the season. Scott Nicholls now faces a battle to keep hold of the number one berth with Michael Palm Toft breathing down his neck. They boast averages of 8.19 and 8.12 respectively. New Panthers averages (effective from September 1): Scott Nicholls 8.19, Michael Palm Toft 8.12, Ulrich Ostergaard 7.35, Bradley Wilson-Dean 5.74, Emil Grondal 4.77, Tom Bacon 4.52, Simon Lambert 4.43.
n Panthers hope to have Ulrich Ostergaard back for their next SGB Championship outing. The veteran Dane is on course to return for a home clash against Berwick on Sunday, September 9 after two months out with broken ribs. n Panthers will go to Workington for another of their outstanding fixtures on Friday, September 14 with the cut-off date now having been pushed back to September 16. 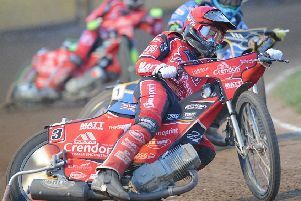 There is still no date for a trip to Lakeside although they will face the Hammers on September 29 (away) and September 30 (home) in the quarter-finals of the KO Cup. They have also arranged an inter-league challenge at National League side Birmingham on September 12.